A very Happy Christmas to all my blogging friends! Thank you to everyone who has left a comment on the blog since I started in March, your encouragement and enthusiasm has meant so much to me. 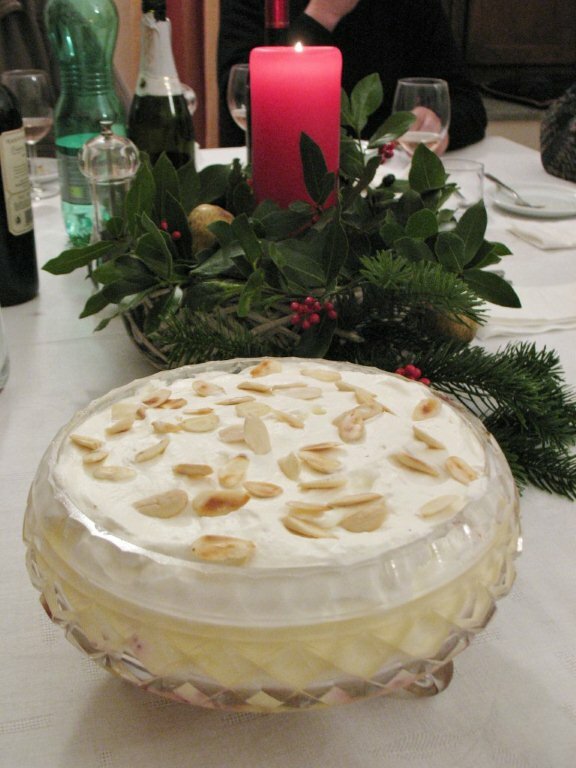 Last weekend I cooked an English style Christmas dinner for my Italian gardening friends, including trifle, which was a new experience for everyone. We have been lucky and managed to reach family in Suffolk; partly this was due to some guardian angel that meant that I booked our flights to Gatwick and not as I thought I was doing to Heathrow (all flights from Rome to Heathrow were cancelled but those to Gatwick went ahead, albeit a couple of hours late. Then the car was booked from Heathrow but with all the cancelled flights we were able to pick up the car there anyway. I feel very fortunate as I know so many people have had their plans to be with family ruined. The roads were clear but the countryside around glowed with white, making our journey quite magical. The snow has now cleared here. After the December Bloomday on the 15th December we had a very cold few days with temperatures dropping to at least minus 6° C (and that was at 6.30 in the morning. Note to self – buy a max/min thermometer and start using a rain gage to understand what is happening weather-wise. The remaining pepper plants are now dead, even the black Tuscany cabbage didn’t look to happy though I think it will recover if the cabbage white caterpillars don’t eat them. I would have thought that the minus temperatures would have killed the caterpillars but no, they are very hardy and there are no wasps to eat the eggs now! I’m looking forward to reading all the end of year reviews and maybe your plans for 2011 next week. Up until this week we have been very lucky with the weather this autumn. Yes, we’ve had a huge amount of rain, but that is necessary after no rain for 3 months in the summer. The days in between have been sunny and mostly warm. This week the temperatures are really dropping! I know many of you think Italy is sunny and warm always but I actually think it is colder here in Viterbo than it was in southern England during the winter. The skies are a beautiful pale blue and the temperatures are forecast as going down to minus 3 or 4° C but there’s also a north east wind blowing strongly (Grecale – I love that the winds all have a name) so with the wind chill factor, that’s about minus 8°C. This is about the coldest it’s been since we moved here and it is forecast for the whole week, then next week warmer temperatures again and rain. 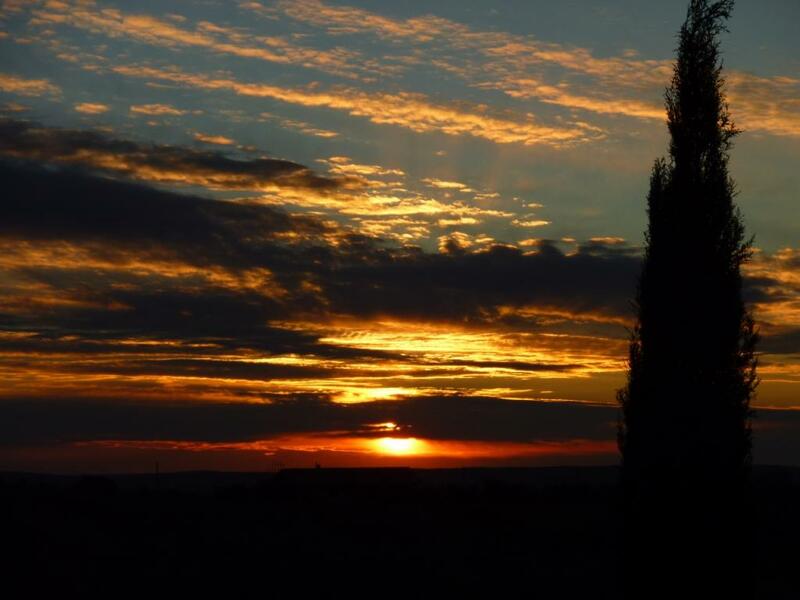 The cold days bring wonderful sunsets, for me they are even more beautiful than those in summer. 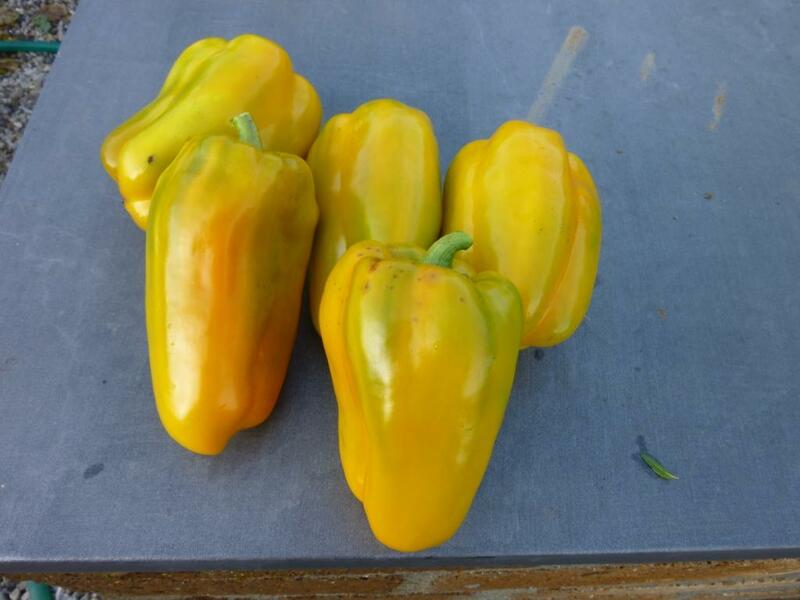 I harvested what were definitely the very last peppers this past weekend. One red, one yellow and several green; I roasted them and they were still deliciously sweet. I also lifted the fennel because I know that won’t stand the frost. I made orange and fennel salad yesterday and will cook the rest and serve them as a vegetable during the week. We took all the ties off the dead tomato plants and took down the canes, I want to plant garlic and onions in this bed soon (garlic on the shortest day of the year) so need to tidy it up a bit and clear it of all the fallen tomatoes, peppers and chillies that will seed themselves next spring if I don’t. I hope it’s not too cold to get the garlic planted. Until this cold weather the roses have surprised me by flowering so well. 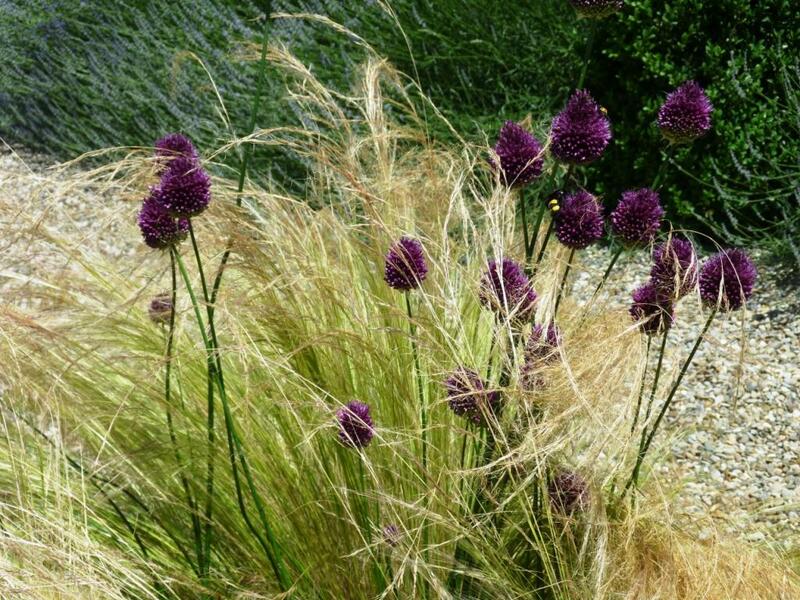 The major interest in the garden is now from seedheads, berries and fruits. I don’t have anything with colourful stems unless you count the Gaura. Cornus, sadly, needs more water than I am prepared to give it and the sun is too scorching in the summer for any of the Acers with good stem colour. 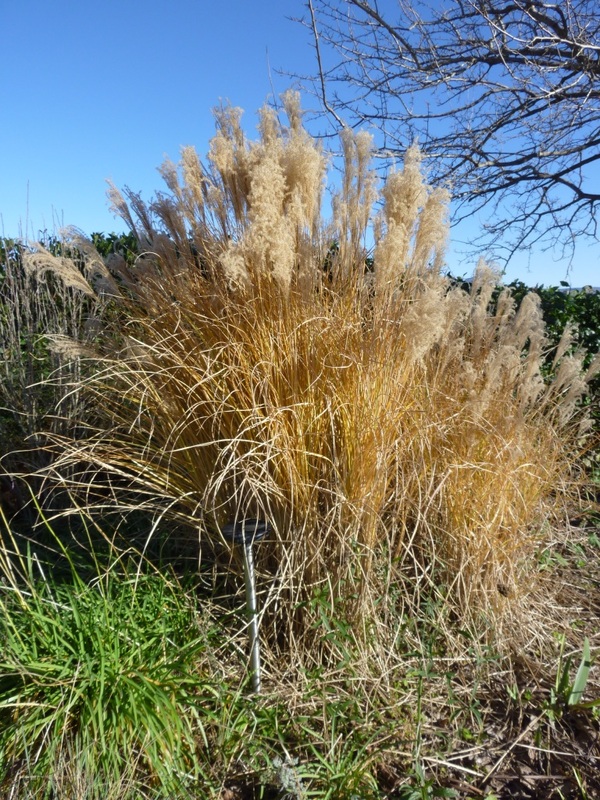 Interestingly Miscanthus ‘Morning Light’ was still wonderfully green until the frost on the 5th December when it turned a sunny yellow – its seedheads are still looking fabulous though, and it remains one of my favourite grasses. 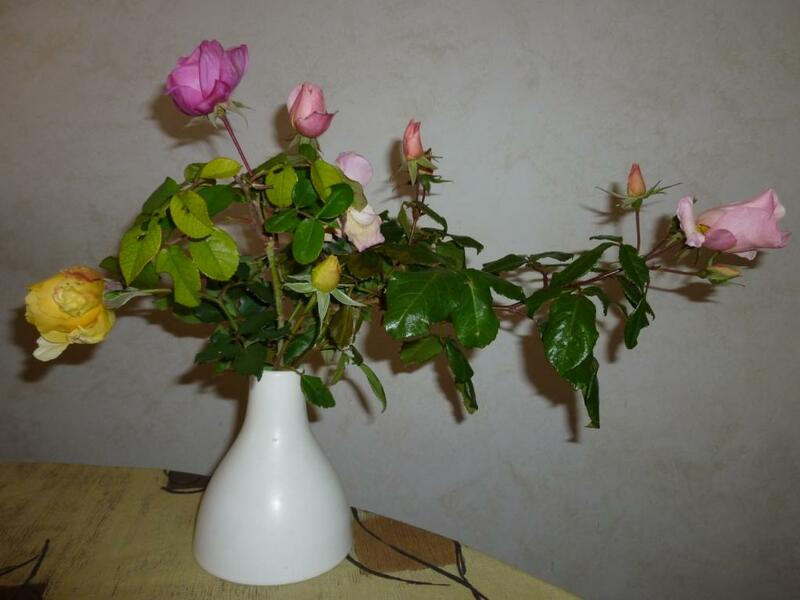 On Monday 13th I picked some of the roses so I could enjoy them inside the house as I thought they wouldn’t survive outside. I was pleasantly surprised as I took photos that many buds still look viable. The really big surprise was a single Muscari that I discovered just beginning to flower under the pine tree; I certainly didn’t expect to see that for another couple of months. Click here or on the the Muscari image above to see a slideshow of all the brave plants flowering today. We have such strong winds here that most of the leaves that have dropped from the trees have been blown off the borders and have ended up under the hedge, where I’m happy for them to stay. The only things that have been completely blackened by the frost are some Cannas I grow for their leaf interest and the Dahlias so nothing that you wouldn’t expect to happen. 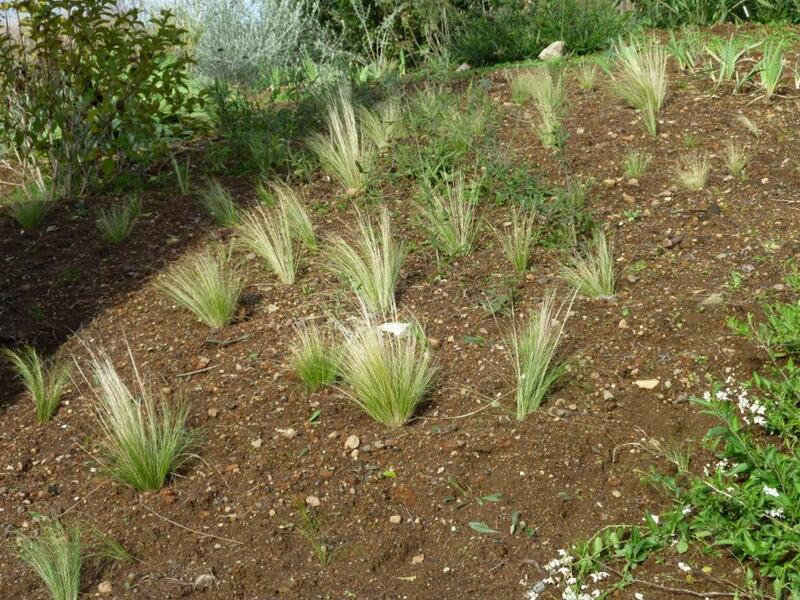 I have been trying to weed whilst I planted bulbs (not quite finished yet – but nearly) and then to mulch to try and stop annual weed seeds growing during mild spells in the winter and next spring. 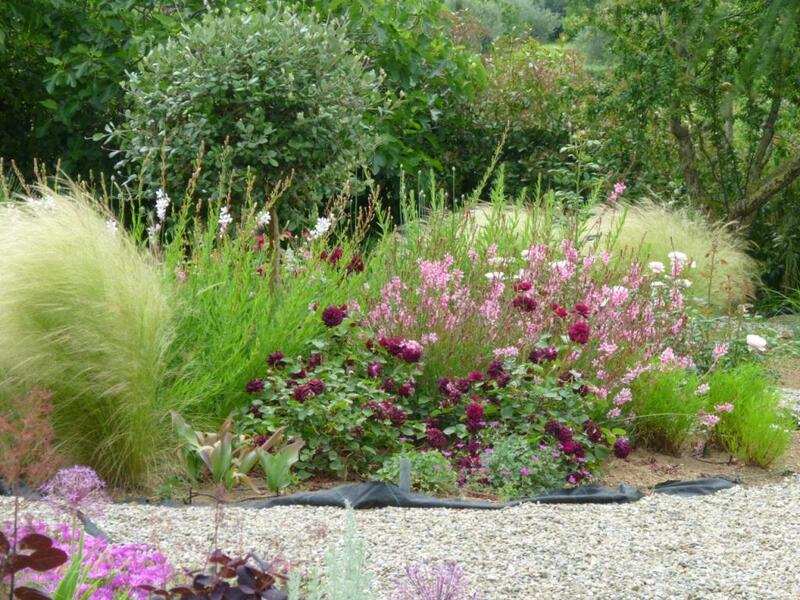 Some beds and borders are very difficult to get into until the plants die back a little as all the beds are planted very closely, especially the left hand border. I definitely need to get in there fairly soon. 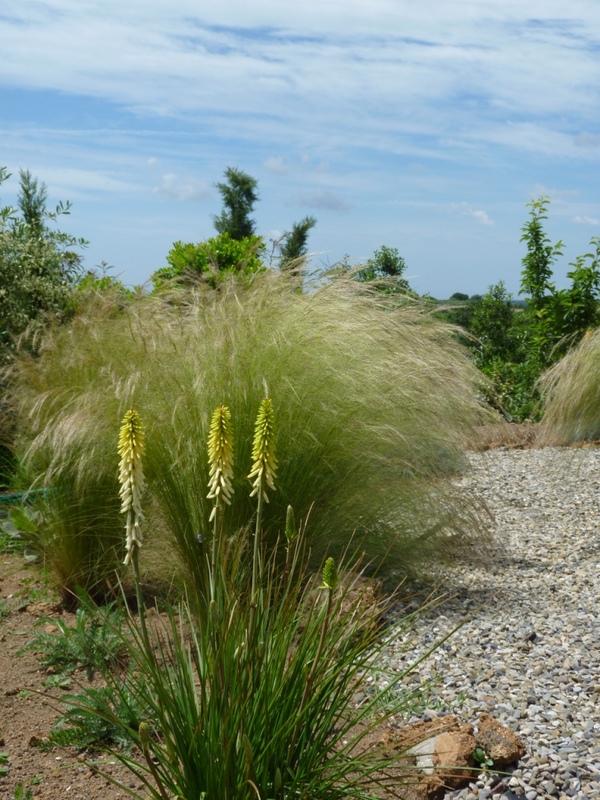 With many thanks as usual to Carol at Maydreams garden for hosting Garden Bloggers Bloomday. 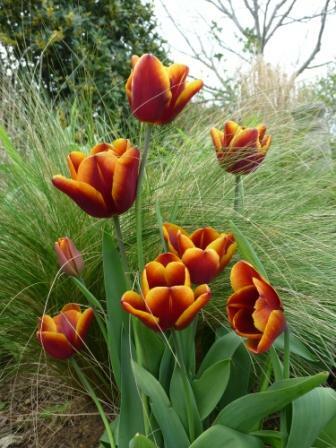 Visit her site to link to gardens all over the world and see what’s flowering in everyone else’s garden. Carol has SNOW and you can understand why she dreams of May. 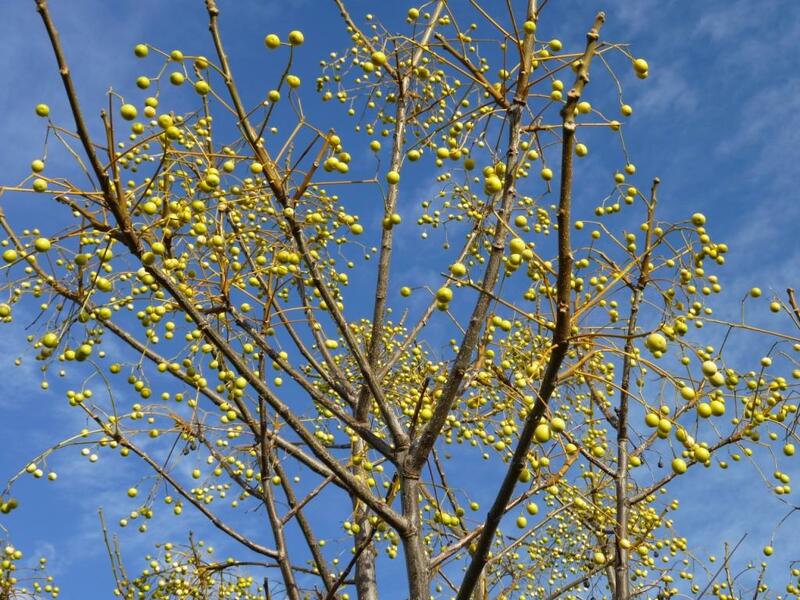 This is the first of a series of posts I intend writing during the winter. I thought that while the weather is not so good to be outside enjoying the garden I would spend some time pondering the effects certain plants have in the garden. 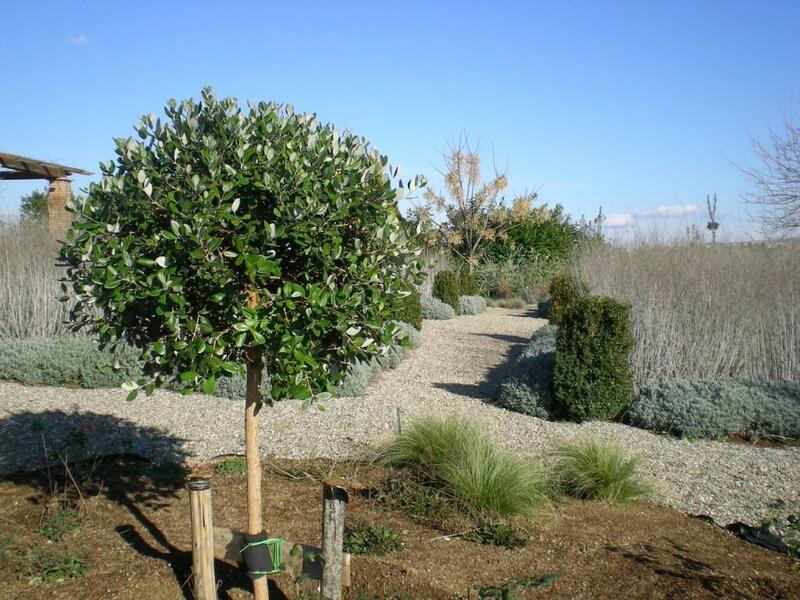 They will probably all be plants that in themselves may seem very ordinary, very easy, not worth a second thought; but that in reality support the performance of other plants adding to the overall beauty of the garden. 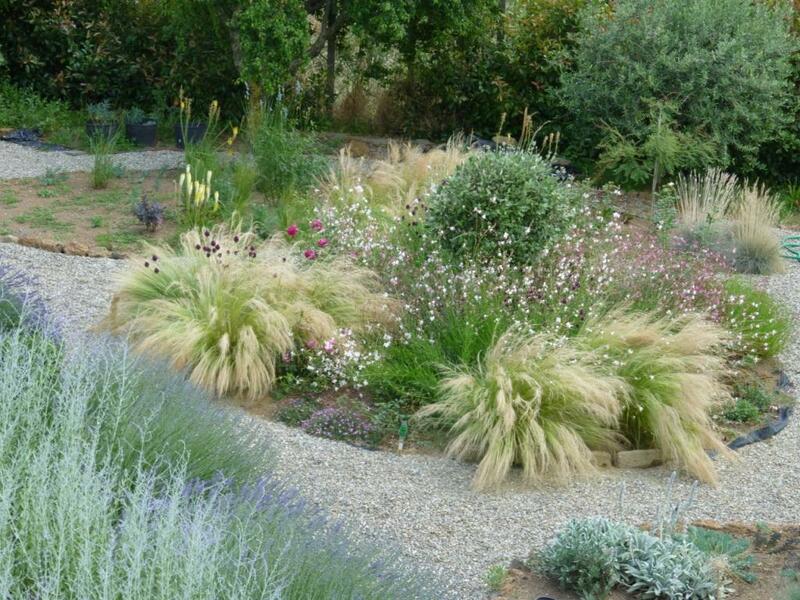 I have chosen Stipa tenuissima as my first plant because for me it performs in every month of the year, supporting a changing cast of seasonal flowers. 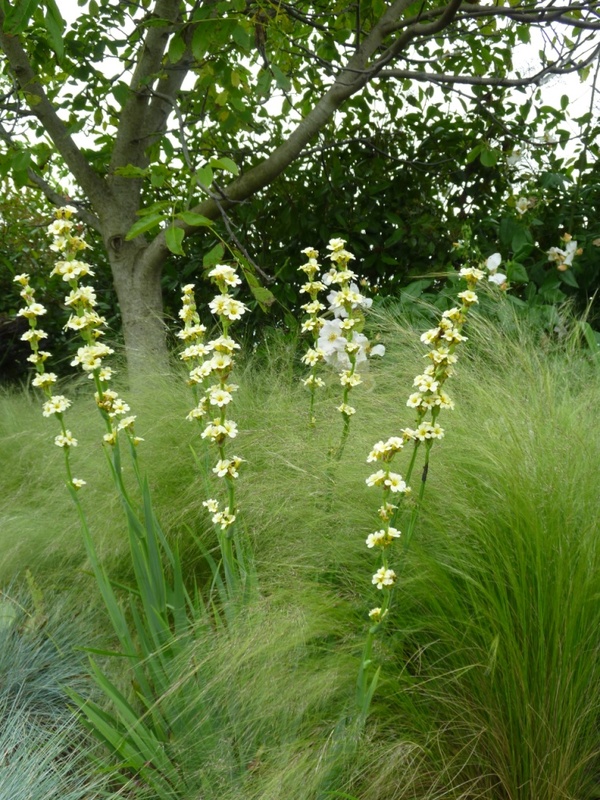 Giving them a soft green or honey- coloured background; also giving them physical support as something to lean on; filling in gaps that would otherwise be bare soil. 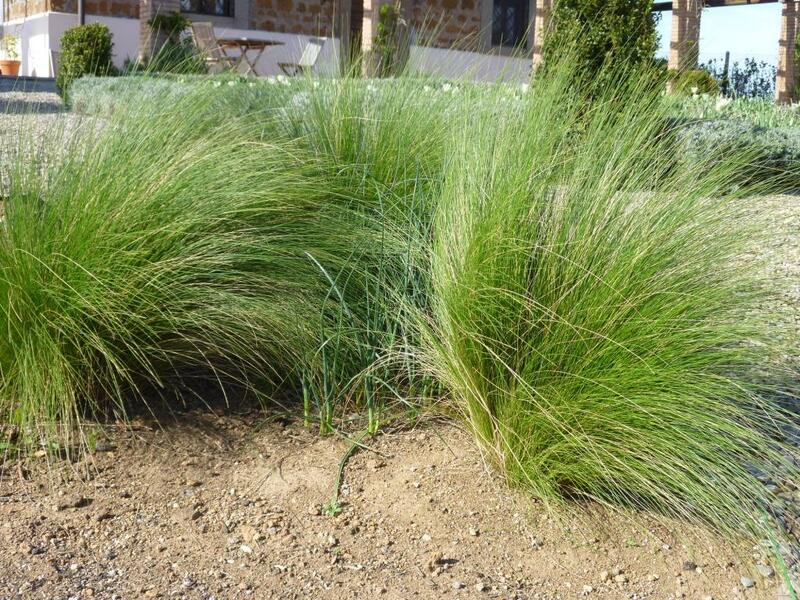 As I have mentioned here before, it is a plant that self seeds profusely in my tuffo soil! 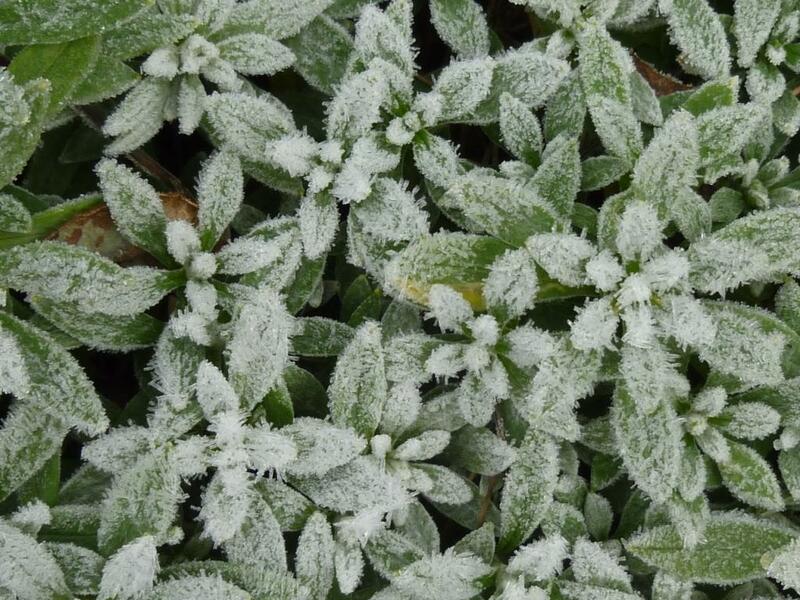 Even if you don’t want lots more plants this is not a problem they are easily removed and can be added to the compost heap without fear that they will reproduce from their roots. 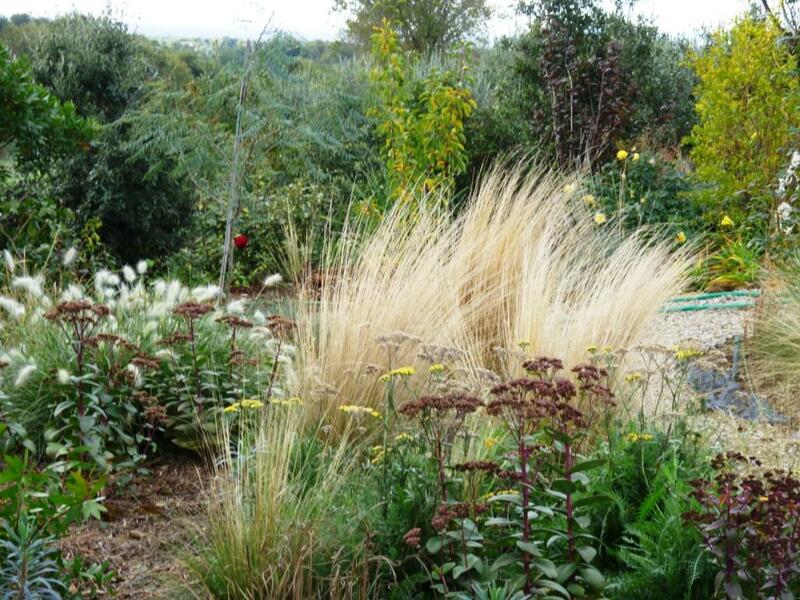 If there is a downside it is that they look wonderfully green during their first year of growth but after ‘flowering’ they turn honey- blond and unless you remove the dead flowering stems and pull or comb out all the golden foliage it will remain hiding the new bright green leaves that add so much to the garden during the winter. 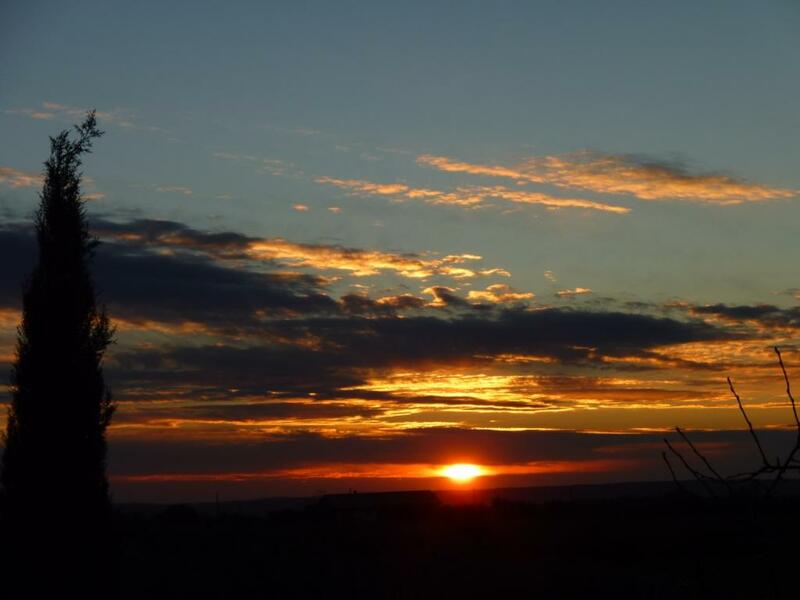 I usually pull the strands out with my fingers, combing through the plant; I am considering using a small rake, the kind we harvest our olives with –like a child’s rake for sand at the beach. Nurseries often cut back the foliage but I think this leaves an ugly clump of dead foliage and it loses its lovely fountain quality. As I have so many seedlings I’m considering removing older plants and simply leaving the newer plants. On the slope which I have been discussing in my ‘End of Month Reviews’ I will leave them to see what happens – I want the whole area to be like a prairie so unless the Stipa begins to crowd out other species I will be happy they are covering the ground stopping more pernicious weeds taking hold. 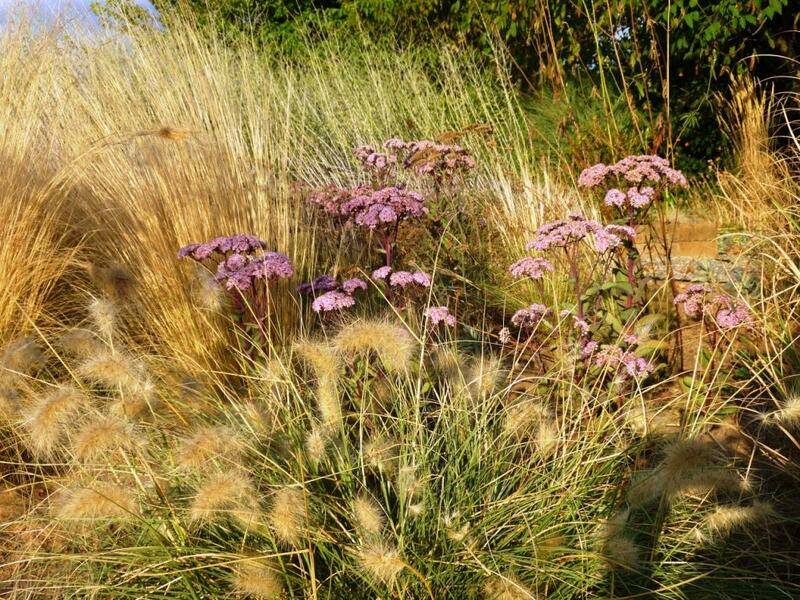 For me this last phrase is the most important – the movement (and therefore life) this plant gives to the garden is incredible. 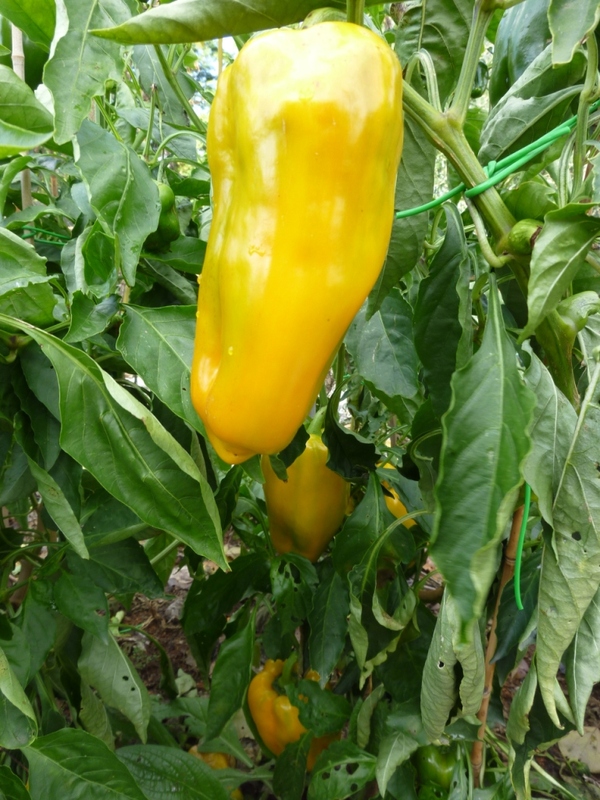 On Saturday I harvested another five yellow peppers – if someone had told me I’d still be harvesting them now I would have thought they were crazy. Peppers in December was something I would never have dreamed possible! I also harvested more chillies – red and green to freeze ready to make Thai curry pastes when I have time. 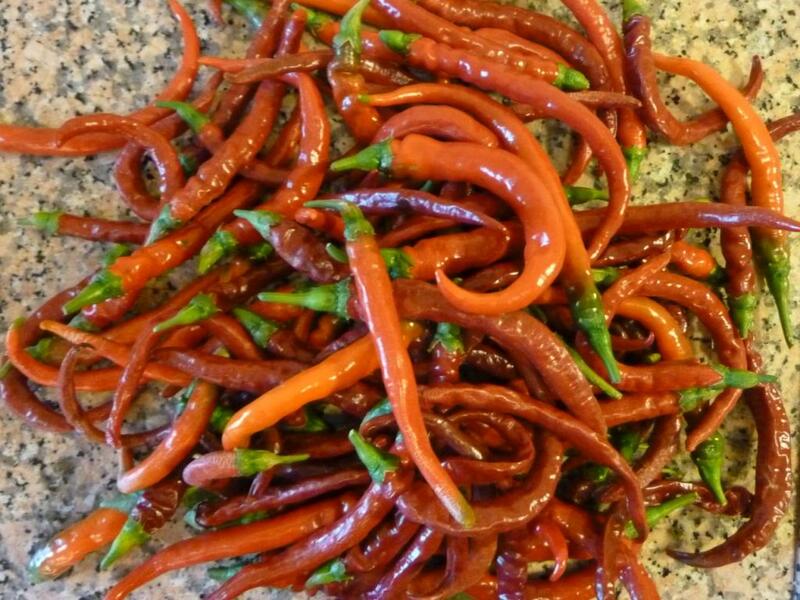 I have already dried a huge quantity but sometimes I prefer using fresh chillies to dried. There was a solitary aubergine left on a skeleton of a plant, I thought it would be bad inside but when I sliced it to cook; it was hard and white inside and tasted delicious, after roasting in the oven along with the peppers. 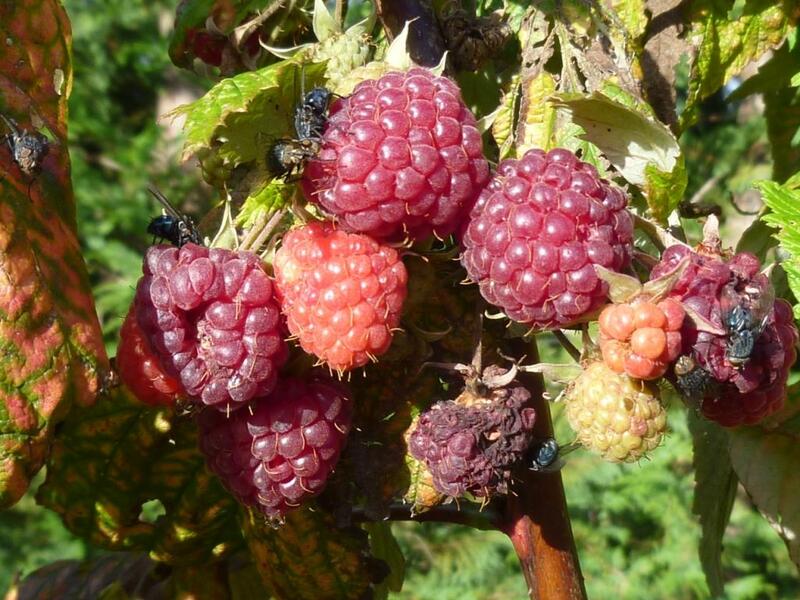 I even found a few raspberries, though the flies seemed to be enjoying them which rather put me off eating them. While walking around the garden I found this fallen leaf in amongst some wild rocket plants. 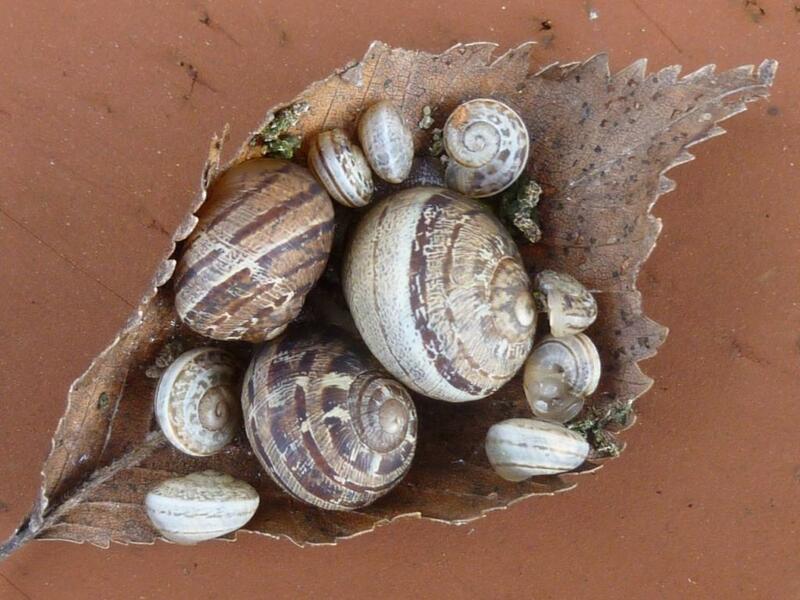 Quite why so many snails of varying sizes where congregated there but they made a good photo before I disposed of them! It was cold in the morning and a little grey but by mid-day the sun was shining and it felt warm on my back as I continued tidying up the vegetable garden. When I went to bed the stars were shining so I imagined that it would be a cold night! I awoke to a pink tinted dawn and blanket frost on the fields, but it was Sunday so I snuggled back into bed, promising myself that I would get up to photograph the frost before it disappeared. I was due to help some friends, who have just started a nursery, to put the plastic on their poly-tunnel so I was very glad it wasn’t raining today as had been forecast. 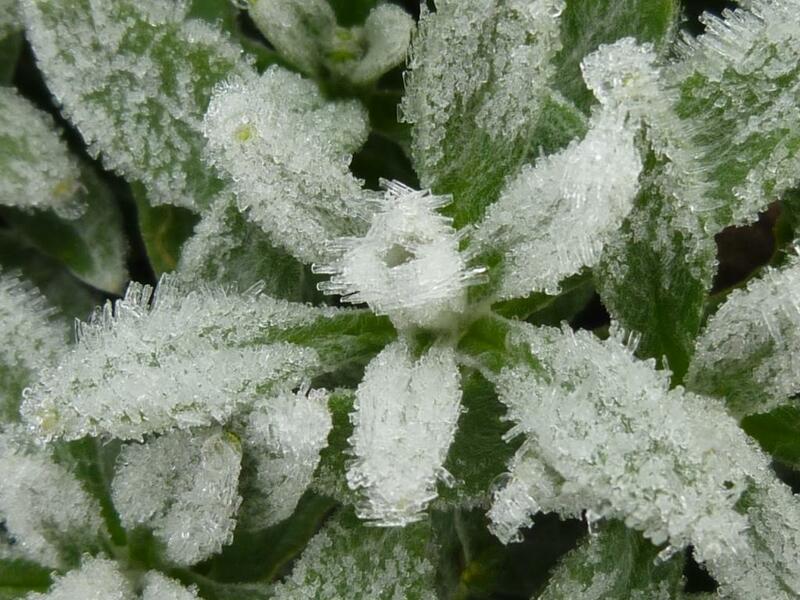 Again I didn’t expect that the plants that would look the best with frost on would be silver leaved varieties.